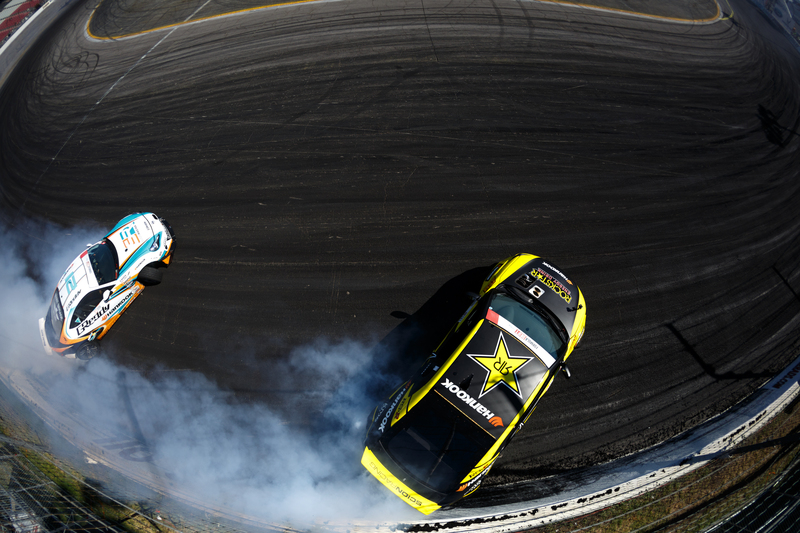 IRWINDALE, California (October 11, 2015) — Fredric Aasbo and Papadakis Racing scored the triple crown of drifting Saturday night at the Formula Drift season finale, winning the 2015 Formula Drift Championship, the Formula Drift World Championship and capping off their big year with a win in the final contest of the season in the Rockstar Energy Drink/Hankook Tire Scion tC. “Even though everybody kept telling me, ‘You’ve got this,” I know there’s no such thing as an easy battle in Formula Drift and those minutes between the last practice session and the Round of 32 were the most intense of my life. I’ve never felt pressure like that,” said Aasbo, who sealed the title when opening-round rival Kristaps Bluss made a critical error and spun. Next, Aasbo faced a tough Top 16 face-off with Daigo Saito that saw him put an end to the Japanese driver’s three-year win streak at Irwindale Speedway. He then fought past “Mad” Mike Whiddet in the Great 8 and Forrest Wang in the Final 4. Aasbo’s win at Irwindale Speedway made it four victories in seven rounds of U.S. Formula Drift competition – a series record. No other driver has won as many events in a single season. Team owner Stephan Papadakis said the victory this season is the culmination of a team effort that started in 2011 when the organization brought then-rookie Aasbo aboard and began developing their unusual turbocharged four-cylinder Scion tC drift car. In addition to winning the driver’s title this season in Formula Drift, partner Scion Racing secured the series’ Manufacturer Cup and Hankook Tire won the Tire Cup. The final round of the season at Irwindale Speedway was a highlight event for the series. 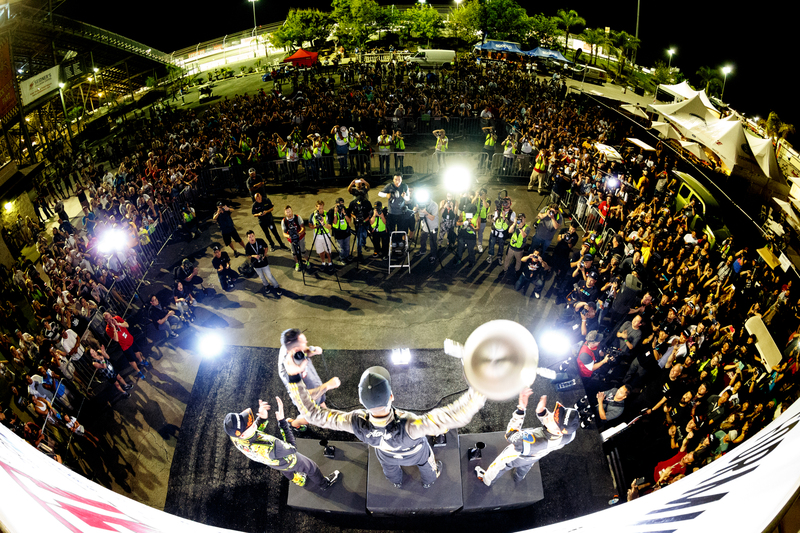 Fans packed the Southern California venue, known as the “House of Drift” for its historic involvement in the foundation of the sport of drifting in the United States. The venue was oversold hours before gates even opened on Saturday. Fredric Aasbo is the 2015 Formula Drift Champion and the 2015 Formula Drift World Champion. With four U.S. wins in 2015, the Norwegian driver holds the Formula Drift record for most wins scored by a driver in a single season. He finished the 2014 Formula Drift champion in the runner-up position and “Fan Favorite of the Year” for the third year in a row. Earlier in the year, he released the first video in his Dreamride YouTube project, #DreamrideLA. The two-time Nordic Drifting champion (2007, 2008) made his U.S. debut at a global drifting invitational in 2008 and turned heads when he won the 2010 Formula Drift Rookie of the Year title. He has rapidly progressed through the drifting ranks around the world and has established himself as both a fan favorite and proven championship contender. Aasbo is originally from Ski, Norway, and now splits his time between his native country and Southern California. He campaigns a full international season, in 2015 running the full Formula Drift schedule as well as select events worldwide in Europe and in Asia.